Originally much of vodka’s stellar rise was sparked by marketing that spotlighted status appeal and indefinable allure. Then came an influx of flavors to entice new consumers into the category. Today, that is changing: customers’ palates are more educated and the focus is on the quality in the bottle. Consumers are interested in the provenance of spirits, what they are made from and how they are produced. And they are trading up for that quality. The Distilled Spirits Council pegs the vodka category at $5.8 billion in revenues; growth last year was a healthy 3.3 percent, with the high-end and super-premium segments surpassing 5 percent. 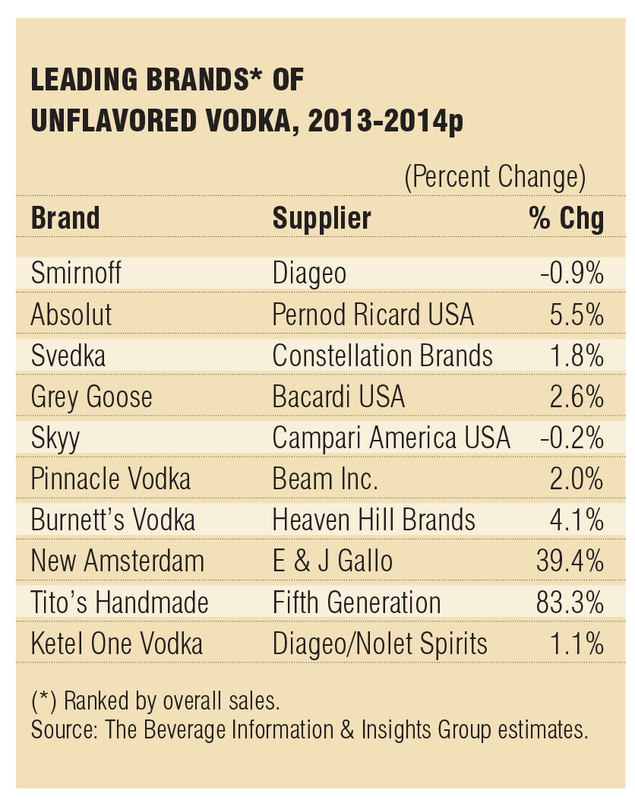 DISCUS also reports that straight vodka at 3.7 percent is outselling flavored. For the past few years, it seemed that much of that growth and certainly much of the excitement centered on the flamboyant flavored sector. Now that appears to be changing: the pace of flavor introductions is slowing, while many producers are focusing on their plain vodkas. A greater emphasis is being placed upon the provenance of the base spirit, and vodka customers are going straight. The top 10 vodka brands continue to dominate the category, although smaller, craft producers are making inroads, especially in local markets. 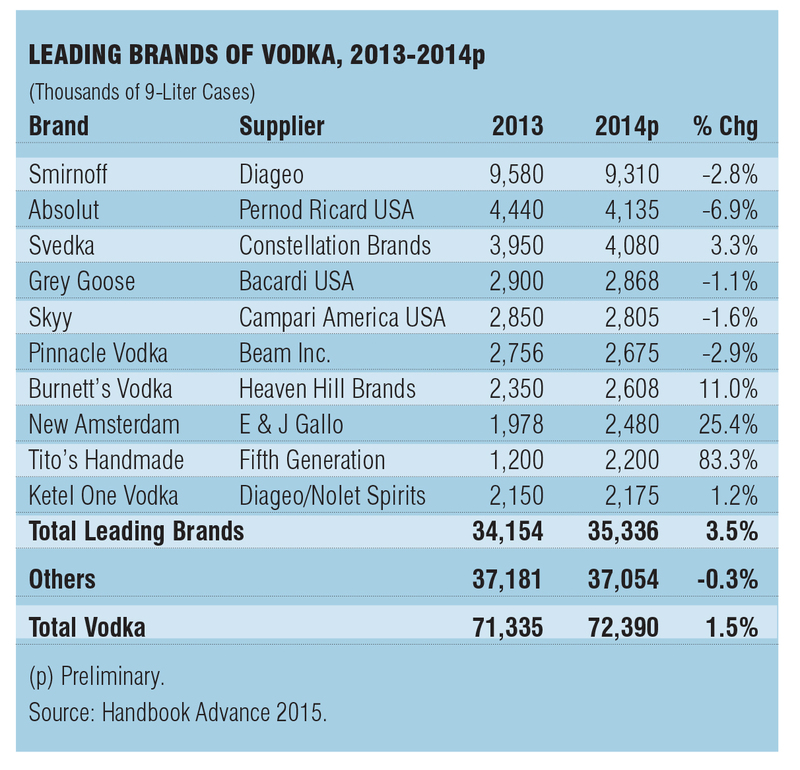 The leader, by far, is Smirnoff, with a projected 9.3 million 9-liter cases, according to the Handbook Advance 2015. All of the top 10 brands are strong performers in the straight vodka arena. And virtually all of the producers sing the praises and potential of unflavored vodka. Retailers report a similar trend away from flavored vodkas and an upsurge in straight sales. “Certainly, flavored vodkas are heading south,” says Jim Rilee, district manager and buyer for the Bottle King chain, with 14 retail stores in New Jersey. “A lot of customers are moving back to regular vodka versus the flavors. People are returning to the old favorites,” he says, citing Russian Diamond as an example. Relative newcomer Tito’s also sells well at Bottle King. “I’m a big vodka fan,” exclaims Craig Allen, owner of All Star Wine & Spirits in Latham, N.Y. That’s one reason he carries 220 different kinds of vodka, including a few oddball flavors like bacon or peanut butter & jelly — which he concedes don’t sell a lot. In fact, the retailer is culling many of the slow-selling flavors from his shelves. “We’re seeing a move toward the unflavored vodkas,” reports Allen. Of those, Reyka and Tito’s are selling strongly. “Flavors are a great way to create the big brand billboard on the shelf, but the majority of sales are from the straight vodka,” observes Broc Smith, owner of Sarasota Liquor Locker in Sarasota, Fla. Younger legal-age customers are being captured by the flavored whiskey category, while more mature palates are going for quality spirits, says Smith. He cites Grey Goose, Chopin and Belvedere as dominating the higher end of the vodka spectrum. Not everyone is down on flavored vodka, of course. “When you exclude confectionary flavors, which are in free fall and down 17.6 percent, flavored vodka is, in fact, incredibly buoyant and growing at 9.6 percent, according to Nielsen,” says Umberto Luchini, vice president of marketing for Campari America, whose portfolio includes Skyy Vodka. “The category has shifted away from confectionary and gimmicky flavored vodkas back toward vodkas with a more sophisticated taste profile, like our own Skyy Infusions,” he adds. The VP says that the Infusions line has continued to outperform the flavored vodka category every year since its launch in 2008. “The speed at which vodka producers are introducing new flavors has certainly slowed; however, consumers still enjoy flavored vodka,” says Tracey Clapp, vodka marketing director for the Sazerac Company. “Some flavors are received better than others and those with broad appeal survive the longest. Palate fatigue among consumers is no secret.” But, she adds, straight vodka consumption appears to be healthy. Sazerac’s contender is Platinum 7X Vodka, so named because it is distilled seven times for a smooth taste profile and clean, crisp finish. “Consumers are increasingly looking for quality vodkas,” Thoukis says. New Amsterdam touts the fact that it is distilled five times and triple filtered to communicate that quality. “Every brand has its own story to tell,” Portwood says. For Tito’s, the core differentiators are the tale of founder Tito Beveridge, pot distillation and the fact that the vodka is made in the U.S. from 100 percent corn. Although most of the news in the category has been flavor launches, there have been some recent developments on the straight side. Stolichnaya announced the arrival of the elit pristine water series: Andean Edition, the third and final limited edition in the company’s ultra-premium vodka series. Each edition of elit contained a different water source; this year the waters of Colico Lake in Chile, a natural spring flowing from the Andes Mountains, was used in the vodka. Just this March, Svedka introduced a 100-proof variant. “We introduced Svedka 100-proof with the goal of expanding our franchise and bringing a high-quality imported vodka to the 100-proof segment, which has been growing stronger than both 80-proof and flavored vodkas year over year,” Pawlik says. The packaging features a sleek, bright chrome sleeve with crisp and sophisticated white lettering. Diageo has released a variant of its ultra-premium vodka line in the limited edition Ciroc Ten. Made from French grapes and retailing for a reported $250, the new vodka was recently unveiled by brand co-owner Sean Combs. Out in the field, retailers have spotted a few new styles of vodka coming into view. The same factors and concerns driving the organic food evolution are fueling interest in organic spirits such as Square One, Ocean Vodka, Tru, Crop and Rain. “Organic vodka is still a very small sector but it’s starting to pick up,” says Rilee at Bottle King. Overall, say the major players in the straight vodka category, the future looks bright. Lately there has been some debate about the impact of the turmoil in Russia on vodka in the U.S. market. Certainly, Russia has had its share of problems: strife in the Ukraine, political sanctions and a collapse of the ruble due to falling oil and gas prices. Many of the brand reps we queried on this topic replied, nyet, no comment or downplayed any consequences. “We have not seen the situation in Russia impact New Amsterdam’s business,” declares Gerard Thoukis, senior director of marketing for New Amsterdam Spirits. Others pointed out that vodkas are produced in a number of countries outside of Russia — Poland, Sweden, France and the U.S.
“The geo political climate only serves to reinforce our desire to find sustainable solutions for everything from entertainment to vehicles to clothing here at home,” comments Nicole Portwood, vice president of brand marketing for Tito’s Handmade Vodka, which, of course, is made in the USA.